Home › Reviews › A Review of the Minecraft Card Game? A Review of the Minecraft Card Game? I’ve been playing Minecraft on the Xbox 360 — and now the Xbox One — for several years now, and that’s saying something, because I’m not an 8-year-old. Neither is my friend, Chris, who is 50 years old, and with whom I’ve spent countless hours online exploring, building, exploding and falling to our deaths in Mojang’s less-than-visually-stunning virtual sandbox environment. 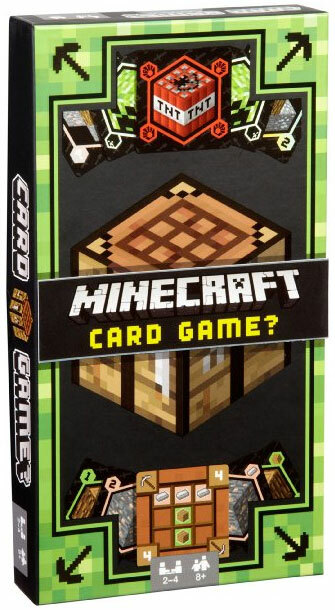 Minecraft Card Game is designed for 2-4 players and is intended for ages 8 and up. After playing a few games with my 9-year-old daughter, I would say that age rating is just about right, give or take a year. With two players, it plays in about 15-20 minutes. The game presents players with five randomly distributed face-up piles of Resource Cards. You have your gold, iron, diamonds, wood, stone cards, and some wild cards, and each card has a number. For example, you may draft a “wood” card with 1, 2 or 3 wood resources on it. As you might imagine, the scarcity of these resources roughly mimics the digital version, with “diamond” cards being the rarest resource and wood being the most plentiful. But it’s not just resource cards in the mix. 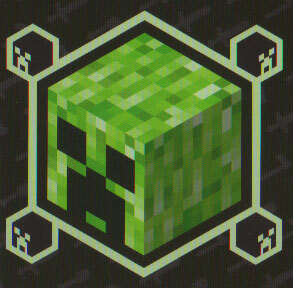 What would a Minecraft Card Game be without the legendary Creeper and TNT? As you’re drafting cards off their respective stacks, you may reveal a Creeper. If you do, it blows up, and every player instantly loses a resource, which is a nice design element that fits with the theme. On the other hand, if you’ve ever played Minecraft and played around with TNT, you know that it can be a bit dangerous, but also helpful in gathering resources. If a TNT card is revealed and then drafted, the player drafting the TNT may take the top card of each resource stack (the TNT card is discarded, so you draw four fresh cards), and keep two of them, discarding the remaining. Of course, stripping cards off all five decks also increases the likelihood that a Creeper may appear, resulting in another card loss for everyone. So, why all this card drafting? 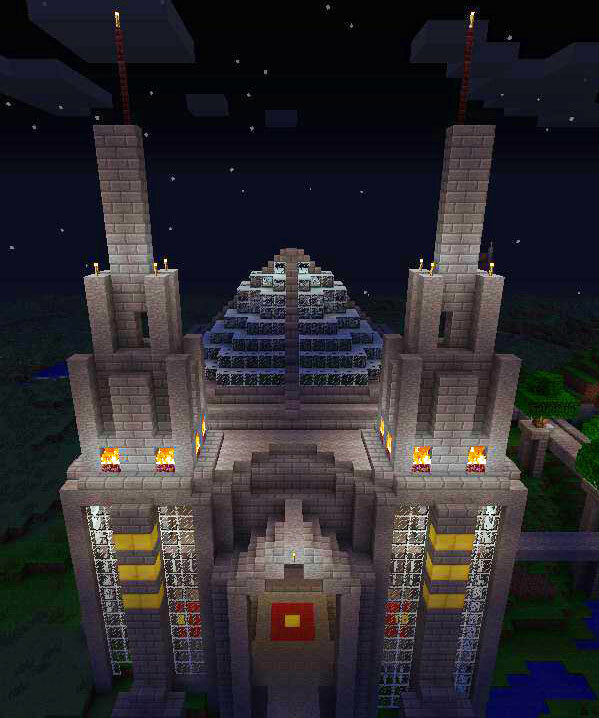 If you haven’t guessed it, you’re collecting resources to build stuff, Minecraft stuff! Other than drafting resources, you may also use your actions to build a face-up item pictured on one of the four Craft Cards, which are also shuffled and stacked just like the Resource Cards. Here you have shovels, axes, swords, pickaxes and hoes to build, each with its own required resources to build and an associated victory point value. You can even reserve a card as one of your actions if you don’t want to build something right away or want to deny another player the luxury. The values of these Craft Cards range from 1 to 5, and roughly scale based on the number of resources required and/or the rarity of the resources themselves. 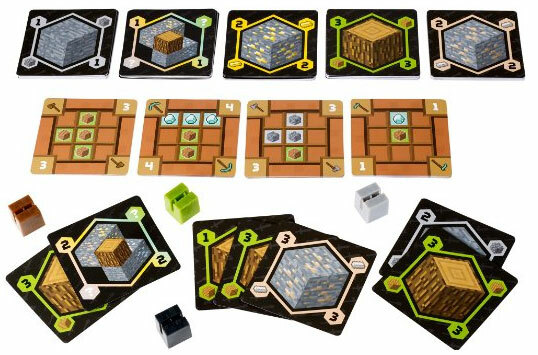 There are some non-thematic values on the cards, such as the 1-diamond/1-wood hoe worth just 1 point and the 3-stone/2-wood pickaxe worth 4 points, but I suspect the distribution of the point values ultimately has more to do with balancing play than having them precisely fit the Minecraft mold. The game design could have ended right there, but the folks at Mojang added another interesting layer to this game. Each of the different items you build has a one-use power related to the item type. For example, building any sword gives you the ability to ignore a Creeper; you don’t have to discard a resource. An axe gives you two free wood resources. The hoe lets you strip off the top card of each resource stack before deciding on which card to take. And the others give you an extra action or take one away from an opponent. Overall, this is a solid game and could very much be described as “Splendor Lite.” In other words, Minecraft Card Game would make a terrific introductory game and primer to Splendor, especially for kids. Two additional little less-than-easy solutions to this would be for the manufacture to use linen-type cards, or scale down the artwork a bit so that the images don’t appear as close to the edges. Even the slightest bump is enough to give you a slice of the card coming next. The other issue is with the four plastic card holders that are used for reserving a Craft Card. These holders are ⅝” square blocks modeled after Minecraft blocks, and they have a groove in them. Unfortunately, they hold the cards a little too well, and after just a few plays, the cards we reserved already show indentations due to the tight fit. I would recommend doing away with the holders during game play if you want to keep your cards pristine. Other than those minor things, Minecraft Card Game is an excellent, fun and fast-playing strategic card game to add to your collection. You are welcome! Game on! What if you go thru all resource cards? Do they get reshuffled and restacked? Your interpretation of the Tnt cars is wrong. However the option to choose two cards is a better method. The Tnt card as the rules state you MUST take the top four cards of the other four piles. Note must and you do not pull from the Tnt pile. This can create a problem though once a resource pile is depleted. As there may not be four to pull from or in a case we had two piles left over and one Tnt in each pile there’s not enough pulling from one pile one card to give you two..
Nice write up though. We will try your method as a better alternative. The thing is we are considering replenishing the resource pile with 15 once gone and using the MUST rules. Ok so……..can you use a “tool” against a “tool”? So let’s say I use both of my action, and I crafted on my last action, and I reveal a card worth 6 points and I don’t want anyone else to get it so I use my “pick axe” to reserve the 6 point card. Can my opponent now use their shovel to stop me from reserving that 6 point card? Or vise versa if I use my shovel to stop someone else from doing an action can they use their pick axe to add another action anyway? Hi, Jamie. Thanks for the questions. Tools can be used any time, however note that the ability of the Shovel is to reduce a players actions by one on their NEXT turn. So to answer you first question, if it is still your turn, someone can’t jump in with a Shovel (they can play it, but it’s not going to stop you from doing anything now). You would have to cycle around the table again before the shovel played on you takes affect. These of course are our interpretations, but I’m fairly certain we have these rules down correctly. Hi, this was very helpful. The instructions that came with the game were ok, but there were troubles we hit while playing the first (and only, so far) time. I’ll be clear, I’m not the gamer, my son is, but we were working through the game together. He went first and immediately exposed a creeper — so with that we were both supposed to discard — but couldn’t. Then, I got tnt and took all the cards and exposed 2 more creepers and 2 tnt’s. I think the last pile had gold. How do you deal with all the creeper and tnt? I don’t think you can hold onto a tnt card as it’s supposed to be used “immediately,” The rules just don’t tell you how to handle these situations. Can you even collect creepers? Any help with how you interpret the rules and these situations would be great. I’m sure it’s worth it…he loves Minecraft. Once he has it down pat, he can teach his friends and play with them. (Also, I’m wondering if it’s worth having more than one pack of the cards…wouldn’t that be more fun? Seems like too few cards for all the mining that could be done. Any help would be great. Thank you! Hi, Ruth! 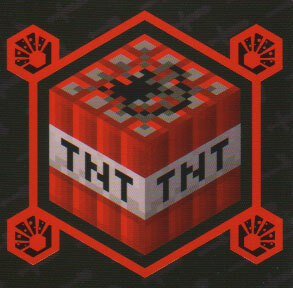 It sounds like the crazy number of TNT and Creeper cards you exposed early in the game was little rough! On a typical shuffle, these cards will be scattered throughout the deck, and you won’t have to deal with all that mayhem first thing. You are correct about the TNT. As soon as you “mine” it, the ability of the TNT triggers, and it goes into the discard pile. Since there are five piles total, you are essentially stripping off the TNT and then the other four cards, keeping any two of the non-TNT cards. Similarly, a Creeper that shows up triggers immediately (everyone discards a resource in their hand, if they actually have one) and the Creeper then moves to the discard pile. I haven’t run into an issue with not having enough cards for a satisfying game, but it is always fun to try new things. I suppose with an extra deck you could easily play for more points. Also, with the single deck, I don’t suppose it would break the game to weed out some of the Creepers and TNT if you continue to find them disruptive. Take out a couple, and just see how it goes! Have fun! I bought the game to play with my 9 year old grandson. We played today for the first time and I am confused about what he said was correct play. He rooted through the crafting cards as one of his 2 actions until he found a card he wanted. He said that was OK, but you can’t root through the resource cards. My instinct says you have to take one of the top cards in each pile. What is the correct method? I appreciate your help resolving this since he won’t take my word for it! You are correct. You wouldn’t shuffle the cards and deal them into four piles if your grandson was correct. You would just put the cards in a single a pile and forget about shuffling. Plus the rules on page 2 state, “take 1 resource card from the top of one of the five Resource Card Piles and place it in front of you.” Pretty straightforward. Thanks for writing and reading my blog. Thanks for this blog post! I just played this game for the first time with my son and we had some problems that we couldn’t figure out from the rules. Your post was very helpful and most of our questions were answered here. Just one last thing we are confused about: What happens when a resource pile is empty? Do you ever shuffle the discard pile and replenish them? Do you have to wait for all of them to be empty? The game is a little light on some of these rules, and it doesn’t address this situation. On the other hand, considering that the win conditions are a set number of victory points, it makes sense to keep playing (i.e., shuffling the discards when you no longer have resources) until you reach that point. The way we played, which was a house-rule, was to only deal out the new stacks once they were all gone. You could certainly decide to play it where you replace a pile when it is depleted, but then you would have to come up with exactly how many to add. In my opinion, it’s probably cleaner to just wait until all the resource cards are gone. Thanks for the whole explanation… very helpful. We still have a couple of questions about the creepers and tnt. 1) Let’s say i got a TNT, then i need to pick 1 card from each other pile, right? while picking this cards i found a creeper! (everyone discard a card or use a sword) after that, do i keep picking cards from the other piles i didn’t pick yet or my action is finished? 2) If i choose to use the HOE, I suppose to clear the top card of each pile before choosing my card. Do i pick from the cards i clear or from the piles? do i place the cleared cards on the discard pile? If someone here can clear this for me, that would be awesome! 1. I would finish your turn. That’s how we play it. The Creeper certainly interrupts, but then you finish. 2. The hoe strips away the cards, and you put them in the discard pile. You then choose from the newly visible cards. Can you have more then one craft card at a time? Can you use both of your actions to get two craft cards? And what’s the point of the reserve card holder? Can you have more then one craft card at a time? Yes. The craft cards are the whole point of playing the game. You collect as many of these cards as you can, and then add up your points at the end of the game. Can you use both of your actions to get two craft cards? Page 2, under the ACTIONS heading, it says, “You may perform them in any combination you want (even doing the same Action twice).” Yes, you can use both actions to get two craft cards. And what’s the point of the reserve card holder? The point is grabbing a card that you can’t currently afford (in resources) to craft and keeping it away from the other players. You could do this defensively, as in you see that someone else is about to build a certain card, so you take it away by reserving it. Or you could reserve it because you don’t quite have enough resources to build it yourself, but you intend to work toward building it in future turns. I played the game with my kids this weekend. We interpreted the rule a little bit differently. We only put the fist card of each resource pile face-up, and other cards remain face-down throughout the game — which means no one knows what he or other player gets, and what they might craft. It also fit the meaning of “mining”, which you can see what’s on the surface but not what underneath. I agree with the interpretation of all other rules. And to one of the questions above, since the first card is face-up, if one of them is a creeper, you simply just don’t mine it yet if players don’t have enough card to discard yet. If more than one creeper or TNT discovered when executing a TNT, you “may” but not must keep two of the four cards, and you can only keep resource cards, which means you have to discard all creeper and TNT cards you discovered.